Pamela Stricker has been named publisher of The Lima News. Stricker has served as the publisher of the Wilmington News Journal for the past 14 years. She was also an assistant regional director for Civitas Media’s Southern Ohio newspapers. Civitas Media owns The Lima News. At Wilmington, she began products such as Salt, a popular lifestyle magazine, and Rural Life Today, which is in 66 of Ohio’s 88 counties. Stricker and her husband, Gerald, hope to soon move to Lima. Gerald currently works for Sugartree Ministries in Wilmington, where the couple have been active in the community as well as Vineyard Community Church of Cincinnati. 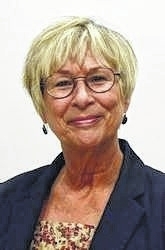 She is a member of Rotary and is on the Outstanding Women of Clinton County committee. Scholar athlete and Clinton County hall of fame programs were also started during her tenure. Stricker was born in Lima, but spent little time in Allen County. Her father, Edmund Mills, was the pastor of Garden City Christian Union Church and Santa Fe Christian Union Church. He felt called to missionary work, and when she was 9 months old, her family moved to Japan, where she stayed until she was 12. Stricker brings with her experience with a number of newspaper companies, including Thomson, Brown Publishing, Gannett and Ohio Community Media. She spent nearly seven years with the Cincinnati Enquirer, including time as its advertising sales manager. Nick Monico, Ohio director for Civitas Media, congratulated Stricker on her new role, and said the southwest group will miss Stricker’s leadership, creativity and dedication. “Pam has become a good friend and a trusted part of our leadership team in Ohio,” said Monico. Monico said he is conducting a search for a replacement, promising that Stricker’s former position will be filled by someone who is a good fit for both the southern Ohio community and for the staffs at the quality newspapers she has overseen.